The Ural project of the day was more battery power. When the temperature drops, you have one chance to start the bike. The stock battery will turn the engine over about 4-5 revolutions before giving up the ghost. Usually, this is enough but the last couple of times that I had the bike sitting outside, I had to resort to the Antigravity battery pack. Which, by the way, works great. With it connected, the engine turns over much faster than with the just the stock battery. 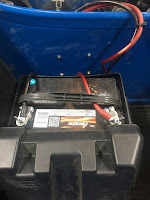 I still had the group 24 automotive AGM battery from the BMW/Cozy rig including the marine battery box. Since there are no plans for anyone to ride in the sidecar this winter, I removed the seat and fastened the box to the floor. I already had a set of two 4 AWG battery cables and ran them over to the stock battery location. I used the positive post on the stock battery as a terminal and moved the ground cable from the negative post to the battery hold down screw with all of the other negative terminals. What this really does is allow me to procrastinate on replacing the stock battery, Which is only three years old. Other items that I hadn't installed this winter due to lack of riding are the handlebar muffs. 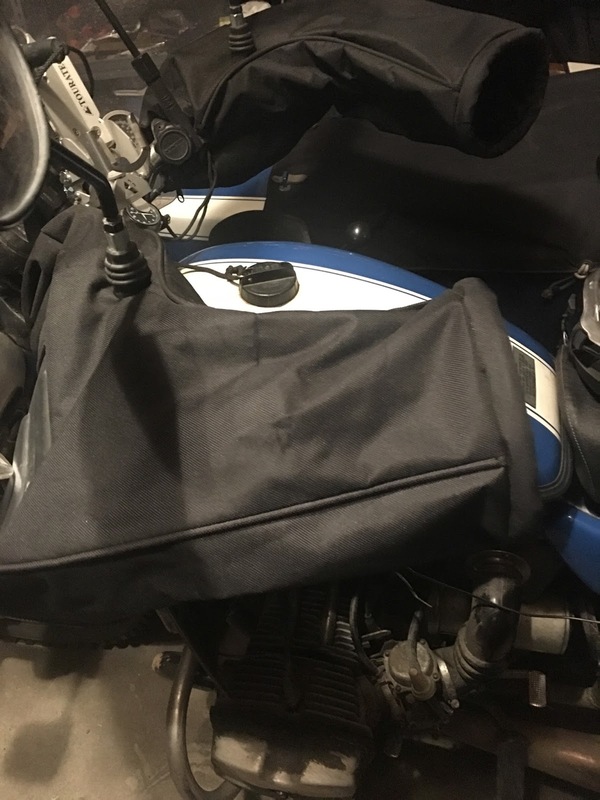 Basically, something to block the wind enabling the heated grips and/or heated gloves to work. I completely forgot about these things. They are kind of a hassle to use as I can't see any of the switches. They are rigid enough to slip my hands in but they have pumped the kill switch. These are just the cheap versions from the local Sportsman's Warehouse but they work well enough. Ideally, I would like to install some Barkbuster shields as they would keep these from putting pressure on the levers. I need to make a constant effort to check that the levers aren't partially pressed due to wind pressure. 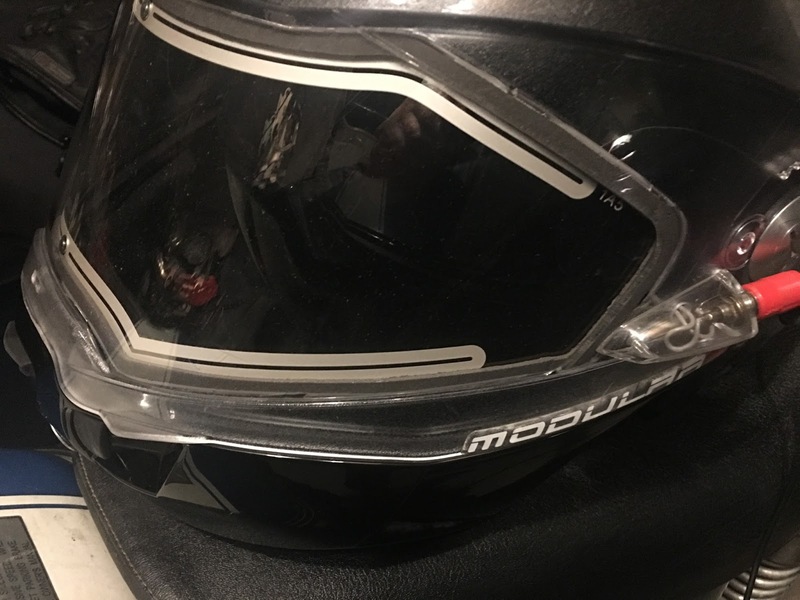 I also dug out the Bombardier Modular 3 winter helmet. It has a heated visor and a very claustrophobic face mask that re-directs your breath out the side of the helmet. I couldn't find the power cable but fortunately, it is simply an RCA audio jack. Thursday Morning Update - Of course, with any change, you have to test so I rode to coffee this morning. A rather chilly -23°C (temperatures sound colder in celsius! It was only -8°F) and just a faint glow on the south eastern horizon. Even with rig cold soaked, it started literally on the first compression. It didn’t run very well for the first few minutes. Unlike when it's in the garage, I actually let it sit and idle for maybe 5 minutes while I got ready to go. The winter helmet worked great. No fogging of either the visor or my glasses. After getting home, I put the rig back into "storage" as my mom is flying back to Fairbanks tomorrow morning. Brrr, your temperatures makes our 51 degrees this morning seem like Bahama weather in comparison. Good thing you put the handlebar muffs on. Today’s temperatures make yesterday’s feel like Bahama weather. -32°C this morning. Needless to say, the Ural didn’t venture out. The option is nice to have. With heated gear, it’s about the same as driving. Just a bit more entertaining. I like the idea of a bigger car battery to start the rig, stock batteries are puny in cold weather. I’m thinking of a battery box platform welded to the sidecar frame between the car and the tug. I’m not sure how the Ural charging system will deal with a LiFeO4 battery. I’m thinking that it may ruin it. But more research is needed.